Lead roofing is a speciality here at North west metal roofing and for over 10 years now we have been providing customers with top quality lead and professionally installed lead roofing systems. All roofers here at North West metal roofing are fully trained and certified roofers with all the relevant qualifications and knowledge, so you can rest assured that your job will be worked upon by experts. Lead roofing needs to be fitted and installed correctly by experts so that no leaks occur and there is no need to worry about it or fix it. If lead roofing is installed correctly than you will usually never need to worry about anything going wrong and you should expect it to last around 150 years. This is why it is important to hire professionals like ourselves and not inexperienced workers. Long-term life span. Last a lot longer than most roofing materials. If you are considering a lead roofing system, would like a free no obligation quote or have any questions please call us today! North West Metal Roofing will be supplying & installing over 600m2 of VM Zinc Quartz angle seam cladding at Everton Footbal Club's Finch Farm traininig facility as part of their continued development of the site. 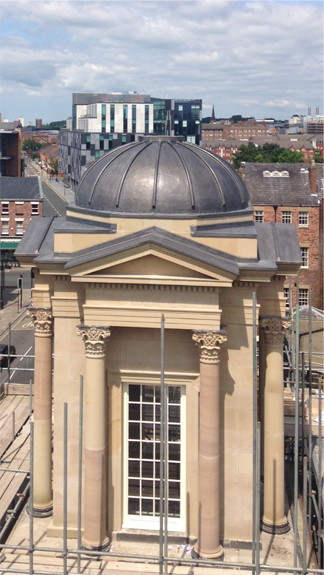 Works are approaching completion at Cityheart Chester, we have installed over 300m2 of Arubis copper cladding with matching parapet cappings as well as PPC aluminium feature works to fascias & windows. Utilising our extertensive experience in complex dome structures we will be installing KME Tecu Gold copper roof coverings to the main dome and minarets at The Lower Atley Street mosque in Accrington. © Copyright 2019 - NW Metal Roofing - All rights reserved.